Shake N' Cor & the Bonetones music is Blues-Roots music with Jazz-Gospel- sometimes rockin' overtones. the music is led by singer songwriter Corry Suter's sultry vocals, Shakey Reay Suter's soulful World Class Harmonica, & backed by award winning players Sandy Sandybone Smith on drums, Dave "Doulbe D" Dykhuizen on Guitar, Keith"Poppy" Picot on Acoustic Bass, & Dave Webb on Piano. Shake n' Cor is a roots blues duo consisting of singer songwriter/percussionist Corry Suter, & Shakey Reay Suter on Harmonica, Keyboards & Vocals. they perform as a duo or a trio with various guests - or with their band the Bonetones - with who they have done 2 recordings - Are You True To Me - in 2012,& their brand new 2017 release "Best Life". 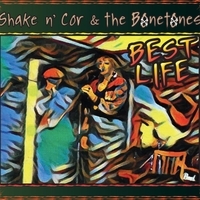 Shake N' Cor & the Bonetones music is Blues-Roots music with Jazz-Gospel- sometimes rockin' overtones. the music is led by singer songwriter Corry Suter's sultry vocals, Shakey Reay Suter's soulful World Class Harmonica, & backed by award winning players Sandy Sandybone Smith on drums, Dave "Double D" Dykhuizen on Guitar, Keith"Poppy" Picot on Acoustic Bass, & Dave Webb on Piano. The recording was recorded live off the floor by Shakey Reay at Shakara in Crofton , BC, & mixed by Sandybone & Shakey Reay, & mastered by Andy Krehm at Silverbirch Studios in Toronto. Their music covers a wide gamut of musical & emotional ground - creating a truly original sound that is blues based yet truly original. Corry Suter is originally from Holland & has been a productive Singer Songwriter for over 20 years, & an amazing visual artist for longer than that. She has brilliant works in many mediums including Oil & acrylic, watercolor, soapstone sculpture, pen & ink, pencil, clay sculpture, & more. She has a natural gift for songwriting, & has been writing & singing since childhood. The harmonica playing of Shakey Reay Suter has enhanced the airwaves, stereos, and stages of Canada and the United States for over twenty years. He spent most of the 80’s on the road out of Winnipeg in Blues, Country, Country rock, and Folk acts, playing in clubs and festivals across Canada. His bands there included the popular Country Rock band Steelwater and the Bourbon Street Blues band. In late 1988, Shakey Reay arrived in Vancouver, where he became a mainstay of the live music & studio scene, recording on countless jingles, demos and Cd’s, including recording sessions with Will Millar(Irish Rovers), Colin James, Jack Lavin(Powder Blues), Billy Cowsill, and the Last Wild Sons. His bands there included a year with Muddy Fraser Band With Sandybone , two Years with Clyde Roulette, a year with the T-Bones with Sandybone, & Steve Kozak, and a year with Russell Jackson(Bass player with BB King for 7 years). With Russell and Clyde he toured extensively in U.S. and Canada. In 1990, Shakey won the Yale Hotel Harp Wars Championship in Vancouver.